Bailey is a Retail Associate here at Tim's Music, and has been part of the family since January of 2018. While working here, she is achieving her AA in Music Education and Performance at American River College. 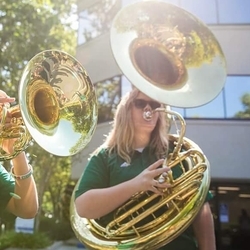 In addition to playing with many of the bands at ARC, she also spends her fall playing with the Sacramento State Marching Band. She began her musical endeavors just under a decade ago, starting out on trumpet, and making her way through the low brass scene. Tuba has been her instrument for over 7 years now. "Why couldn't you play the flute?" "Because then I wouldn't be able to drop the bass."